Only available in store or for delivery in the Greater Montréal region. 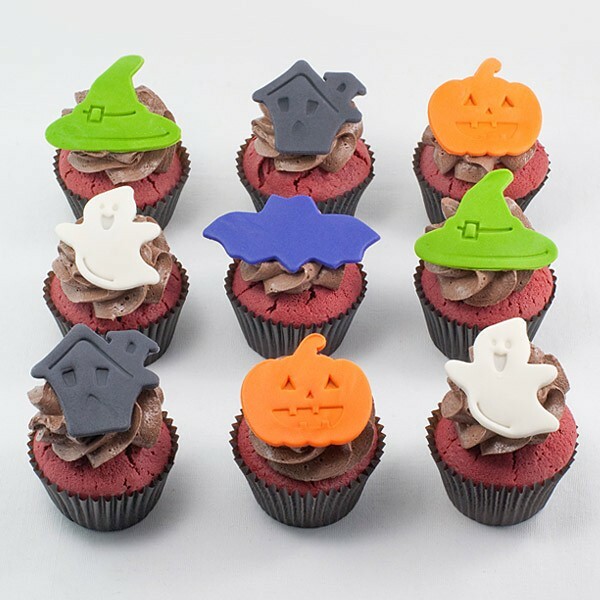 This series of Halloween cupcakes decorated with a frightening marshmallow fondant disc will put some fantasy into your next event. For this very special occasion I offer you these Frightening marshmallow fondant decorations (cat, haunted house, ghost, pumpkin, bat), to adorn the butter cream of my 10 regular cupcake flavors: Vanilla, Chocolate, Banana, Lemon, Coconut Milk, Orange, Red Velvet, Lime-Basil, Chai and Espresso, garnished with my delicious butter cream icing (Vanilla, Chocolate, Lemon, Sugar Fudge, Raspberry and Mokaccino). Those of you who know me know that I don’t skimp on the quality of my ingredients! My cupcakes are always fresh, baked daily with the best possible ingredients (orange, lemon and lime zest, fresh raspberries, fresh basil). I use Barry’s dark chocolate and cocoa. I use an exceptional quality of Madagascar vanilla. The coffee beans are traditionally roasted (Barista coffee). I make my own lemon curd and sugar fudge. I use only butter, no oils, no artificial flavours, no preservatives or powdered sugar. My cupcakes are therefore soft and not too sweet. Many clients have assured me that they are the best cupcakes in Montreal... you be the judge! Cupcakes do not travel as well as ghosts. It is therefore not possible to ship outside the Greater Montreal area. Shipping is available in the Greater Montreal area (Montreal, Laval, North and South shores) at an additional charge. You can order by e-mail info@sweetisabelle.com, or by phone ( 514-570-8668, 2 to 3 days in advance for large orders), and opt to either pick them up yourself or have them shipped (Montreal, Laval, North and South shores only. Please check the shipping charges with us). Photo for informational purposes only.